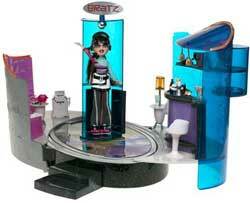 Bratz Flashback Fever Party Bus & Bratz Tokyo-A-Go-Go Dance N' Skate Club (by MGA) are Hot Toys thoroughly reviewed. You already know those Bratz dolls are hip, trendy and totally put together! Now the stylish gang can enter a retro-disco dream world with this club playset that includes a lit dance floor, revolving DJ booth, roller rink, lounge, working speakers, exclusive doll and many funkadelic accessories!